Our flagship trade counter, head office and 60,000 sq ft manufacturing facility is located just minutes from the M8 and close to Ibrox football stadium. Our showroom has our full range of products on display including our popular Selkie® waterproof wall panel solution, Senses kitchen worktops and splash backs, Versatile, Ancona PVC wall and ceiling panels, and Clixeal Vinyl flooring. 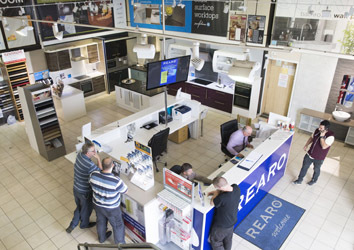 Both trade and public are very welcome to come in for a browse and ask our expert staff for advice. If you’d like to discuss the best solution for a new shower panel or maybe a new kitchen surface, we’d be delighted to help. Please call or pop in for a visit.